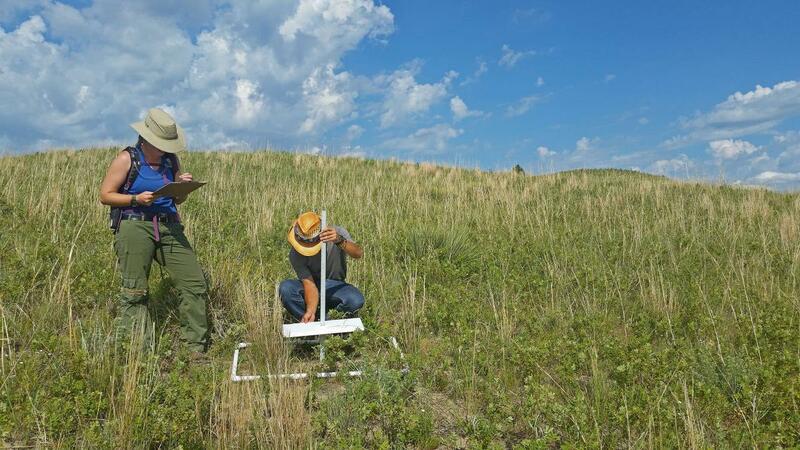 Doctoral student Katharine Hogan works with another student on an ecology project in the Sandhills. As a master’s or Ph.D. student in the National Research Traineeship at the University of Nebraska-Lincoln, you will receive interdisciplinary training focused on understanding the resilience and sustainability of agricultural ecosystems, particularly the Platte River Basin. The basin, which originates in Wyoming and Colorado and drains through Nebraska, is one of the world’s most productive and efficient agricultural systems, not only supporting agriculture but also meeting the needs of industry and wildlife and for recreation and drinking water. Around the world, such competing demands on water resources, and external threats such as climate change and competition for land, make it increasingly critical to have the best and clearest scientific information to resolve complex food, energy, water and ecosystem services problems. Students in the NRT at Nebraska are gaining understanding of how resilience is generated in complex systems and preparing to be the next generation of natural and social scientists, computer and biological systems engineers, managers and policymakers. Upon graduation, they will receive their degree from their home department—such as the School of Natural Resources, the Biological Systems Engineering Department, the Department of Agronomy and Horticulture, the Department of Computer Science and Engineering, the School of Biological Sciences, the Economics Department, the Civil Engineering Department or the Department of Political Science—and receive advanced training in either Agricultural Complex Systems or Adaptive Management. Students meet in the NRT laboratory for special trainings and interdisciplinary collaboration and also participate in externships and workshops, engaging with partners from the agricultural industry, state and federal government and private organizations. Students use resilience and panarchy theory, data science, novel sensing technologies and modeling, adaptive management and policy interventions. They help develop innovative tools for collecting, synthesizing and analyzing data needed to make management and policy decisions. Students also benefit from collaboration with other NRTs and from an international experience comparing the agricultural ecosystem of the Platte River Basin with those in Western Europe through the Delft Institute for Water Education in the Netherlands. This NRT diverges from past academic cultures in that students and faculty members from various disciplines meet, collaborate and coalesce around one goal: responsibly managing agricultural ecosystems. Knowledge gained from work with the Platte River Basin is expected to be used by students to manage ecosystems and meet career demands of the future.